For the love of content, stop churning out rubbish. Outstanding is the new standard. Gone are the days when brands focused on producing any content. Today, the focus and energy have shifted towards creating exceptional, emotionally-charged, captivating content that's difficult to copy or replicate. The bar is high. And if you can't jump over it, then so long. This is how you can cut through the noise, attract and connect with new audiences instantly, and make the Internet a more interesting place to hang out in general. Content marketing is about educating, entertaining and delighting your prospects through various forms of content - be it blog posts, guides, videos, infographics or anything else. And while good content marketing is focused on creating and curating valuable, high-quality, non-product content, it is always strategic and purposeful -- designed to form positive associations, build loyalty and eventually, convert. If you ask me, content marketing is the only way left for brands to tell their story and have someone listen to it. What are some content marketing formats? Okay, I heard you the first time. Blog posts are on the list. (I love them too). But is there anything else? Something, you know... slightly more vibrant? And UN•boring? Relying exclusively on blog posts to engage, educate and delight your audience is optimistic at best. Let’s just say that blog posts are not like avocado -- you can’t have them for breakfast, lunch and dinner, and still enjoy every mouthful of that stuff wholeheartedly (avocado fans will understand). The beauty of content marketing, though, is that it can be truly diverse without costing you much extra time and effort. To keep readers falling in love with your content every time you come out with something new, introduce fresh, exciting formats to spice up your game. Ensure your content caters to your buyer personas (or reader profiles). Create content that’s mapped out against the buyer’s journey. Set clear, measurable objectives and purpose for every content campaign. Optimise your content and keywords for SEO. Make sure that whatever you’re publishing is better, cooler and more valuable than the current #1 result on the search results page. This is one of the most powerful storytelling examples I’ve seen in the past few years. Not only because it tackles such a heartbreaking topic, but also because of the masterful combination of captivating images, videos, data, maps, personal stories and other content formats that all come together to tell one story. 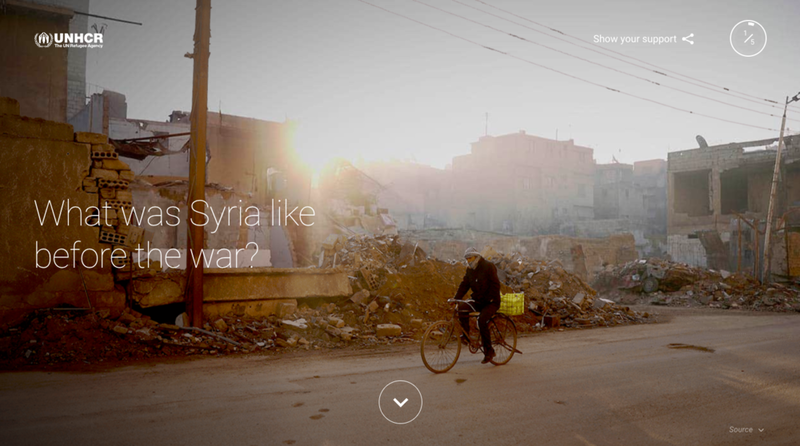 Searching for Syria is a unique project that demonstrates how effective immersive storytelling can be. Takeaway: Merging and balancing various content formats allows brands to really dive into the story and keep the user engaged until the very last slide. It would be impossible to retain the reader’s attention if it weren’t for the seamless bite-sized experience and varying formats. Once the CTAs emerge at the very end, the reader is compelled to take action. If you’re a serious procrastinator, you might know a thing or two about Buzzfeed quizzes (do we have the same spirit animal?). Yet, Buzzfeed isn’t the only quiz-loving publisher out there. More and more brands are exploring this content format to engage, inspire and nudge consumers towards a buying decision. A great example is Airbnb's trip matcher quiz that helps travellers choose their next destination. Matching the traveller's personality with unique traits of the destination, Airbnb effortlessly marries inspirational and promotional content. Takeaway: Who doesn’t love a good quiz? If your products or industry lend themselves easily to this content format, take advantage of its engaging and interactive nature to inspire your customers to learn more about themselves and use their purchasing power to satisfy the newly-discovered needs. "I'll believe it when I see it" -- have you heard this one before? There's no denying that humans are visual beings - we think, eat and shop through our eyes. So it's no coincidence then that two of the five leading social networks -- Pinterest and Instagram -- are also visual mediums. Somewhat unsurprisingly, successful beauty, health and decor brands often turn to Before & After Lookbooks to capitalize on the impressive transformation demonstrated through before and after images or videos. Takeaway: Using compelling images to showcase your work results and success stories is a powerful and effective strategy; few formats can beat the visual comparison. Diligently document the journey from before to after and use the visuals to convert your prospects into paying customers. Crafting in-depth, practical guides and eBooks is a tried and tested inbound marketing tactic. Typically, considerably longer and more in-depth than blog posts, guides and eBooks are designed to generate leads. Once a reader is hooked and eager to learn more about a particular topic, they don't mind exchanging their email address for a high-quality piece of content. And brands that spend time on producing exceptional, educational content can benefit greatly from this kind of knowledge trade. Takeaway: Focus on creating truly valuable content that helps your prospects solve problems, answers questions and offers solutions. Establishing your brand as a trusted source of information will allow you to build relationships and eventually, gain new customers. Lifelong learning is the world's new obsession. The fast-paced, tech-driven world that we live in is forcing us to continue learning every day. And while it's, of course, a necessary and rewarding experience, it doesn't quite fit in most of our busy schedules. Email courses is a brilliant response to this modern problem. Delivering bite-sized, practical lessons directly into learners' inbox, solutions like Highbrow plug the gap in the educational market and provide brands with a unique opportunity to connect with potential customers. Perhaps still less-known than infographics or eBooks, this content format offers the advantage of novelty and great engagement levels! Takeaway: Have heaps of valuable content that could be easily repackaged into bite-sized email lessons? Consider developing an email course to raise brand awareness and connect with potential customers. Focusing on online education as a key aspect of your content marketing strategy won't just build trust and respect, it will also help you improve customer satisfaction and retention. As one of the most popular content formats, online courses combine some of the biggest online learning advantages -- it's a self-directed, visual, and truly convenient way of learning. Leveraging this content format puts brands in the position of "experts", deepening and strengthening their relationship with potential and existing customers. Takeaway: This example from Simon Sinek illustrates how online courses can be turned into content marketing gems. Consider adding this format to your content marketing strategy if you have the means to create engaging videos and an audience that's hungry for knowledge. Wildly popular amongst online users, infographics are a neat way to visualise data, present research findings or communicate a number of insights in an easily digestible format. Brands often turn to infographics when they have data that would be dry and boring if published on its own, but instantly come to life when paired with striking illustrations and drawings. According to OneSpot (see below), infographics are 30% more likely to be read than a text article. Takeaway: For your convenience, here's an infographic about infographics. Use this content format to leverage unique data and research findings, engage readers with eye-catching illustrations and design, and establish thought leadership. Theories of Everything, Mapped looks like something Sheldon Cooper would use as his screensaver and maybe even frame above his bed (yeh, it’s that good). It’s an interactive map exploring the deepest mysteries at the frontier of fundamental physics and the most promising ideas put forward to solve them. While I don’t understand most of it, it is still one of the cleanest and most beautiful interactive content pieces I’ve ever seen. Takeaway: If you have content that requires deep-thinking or ideas that are related in a non-linear way, consider an immersive content experience to give your audience a taste of something extraordinaire. Great content is only achievable if you know your audience, their aspirations, interests and pain points. You should always be leading with a solution, not a sales pitch. Digital tools, like this garden planning tool below, are a wonderful way to take your users from merely browsing around to engaging with your product, service or the idea you're trying to convey. By immersing themselves in active planning, designing or conceptualising, your prospects are moving closer to the buying decision (and you're moving one step closer to a sale). Takeaway: Do you know what gets your prospects excited? Can you turn that into a smashing content campaign? Giving your prospects a peek into their dream life, better self or a more successful career could be all that's needed to convert them into customers. Research shows that the average length of the content in the top 10 results of search queries is typically over 2,000 words. While they seem like awfully long posts and you might wonder who has time for that, long-form, well-researched posts tend to generate more traffic and engagement than short blog posts. So it's not unusual to stumble across beasts like this compilation by Siege Media that neatly wraps the best interactive infographics into one very long post. If you're researching interactive infographics, would you rather navigate to one site and have it all conveniently gathered in one post or spend hours Googling and clicking around to find what you need? I think we know the answer. Takeaway: You don't always have to create the content yourself to reap the benefits of it. If someone who's your potential customer is at the consideration stage, seriously pondering over the idea of committing to one brand or another, you want them to be on your website, consuming your content and considering you as the perfect solution. Calculators make for effective content marketing tools because they provide a clearly defined, immediate value to the user, while, at the same time, qualifying leads for the brand behind it. Takeaway: Make the most of online calculators by helping your prospects estimate costs or savings that are directly related to the service or products you offer. This example from RightMove demonstrates how a mortgage calculator can add value to the property hunting experience. It seems that everyone has a podcast these days. Have you figured out why they are so popular yet? If not, let me give you a quick rundown of the most significant drivers behind the sudden uptick in podcast demand. First of all, the production costs are much lower compared to other formats (e.g. videos). Then, you have the mobility factor -- the ability to download and consume podcasts on the go, anywhere, anytime, has led to its increase in popularity. And besides the other factors, screen exhaustion has also fueled the growth of audio content, including audiobooks. You can't read a book while walking to work or doing your weekly grocery shopping, but you can easily tune in to your favourite podcast and squeeze more value out of your time. Starting to see the value of podcasts yet? Then go on, explore and experiment! Takeaway: Here's Malcolm Gladwell's podcast Revolutionist History. It's an incredibly effective way for an author to raise brand awareness of his books and strengthen his personal brand. And with a little bit of creativity, any company can pursue the potential of podcasts and harness its soaring popularity. Suddenly everyone wants video. But only the smart few are really killing it with brilliant ideas and execution. Does your mouth go dry just thinking about standing in front of the camera? Or maybe you’re feeling a little overwhelmed by the pressure to “go viral”? From thank you videos to Q&A's to product reviews, there are dozens of different applications that can help brands rise above the noise and create something exceptional (see my article: 50 delightfully simple video content ideas for your online business for more ideas). If you're not exploring this medium yet, it's time to roll up your sleeves! Takeaway: Video consumption is rising by the hour. YouTube reports mobile video consumption rises 100% every year. It's clear that a well-balanced content marketing strategy needs to include video content. And this brilliant example from TEDEd shows that you don't need to settle for the boring talking-head videos to nail it! Do we even have to talk about this? Case studies, also known as success stories, is one of the most prominent content marketing examples. Instead of telling prospective clients how you can help them, let your current customers do the talking for you. Showing tangible results you can drive and the positive impact you can make will be more convincing than any sales copy could ever be. Takeaway: Choose clients that have an interesting story to tell and you have the data to back it up. Case studies are a mix of storytelling, data visualisation, before & after comparisons and compelling imagery, so don't rely on one element to make your point. Comic-based visual imagery is a quick and cost-effective way for brands to communicate topics that are often perceived as complex, dry or simply "unsexy". Comics artists are not restrained by the real-life considerations and are, therefore, able to approach the subject from an unexpected angle. Google, for instance, had turned to comics when it launched its Chrome browser. Takeaway: Consider adding comics to your content mix if you're striving to appear more approachable, fun and diverse. Adding a twist to your content will help you stand out and establish a name for yourself. With the team at vzaar, we've used comic-based visuals to explain a really rather boring but important topic (see a screenshot blow). Whether you choose to create a range of quote images or craft a 10x blog post reviewing the top must-read books in your industry, book summaries is a simple yet effective content marketing technique. Any company in any industry can apply this technique and connect with their prospects because reading is an old hobby that's been rediscovered anew. Blinkist, an app that transforms the world’s best nonfiction books into 15-minute reads made for mobile devices, has over a million paying subscribers, which goes to show the demand for this type of content. Takeaway: If you want to build positive associations with your brand and join meaningful conversations, spruce up your content with book summaries. It will help you attract better quality leads and build positive associations around your brand. To become a trusted source of information, you need to share interesting data and unique insights. And you can't really do that without carrying out your own research. Investing time and resources into research will enable you to release high-quality, authentic reports that will do both -- attract new leads and generate media coverage. Pack them with graphs, charts, images and custom illustrations and you have the makings of a winning content marketing campaign right there. Takeaway: For any brand that wishes to be seen as an industry leader, research reports is a must-have. Whether you delve into the depths of your own customer base or explore a relevant topic, it's a truly unique opportunity to produce something that no one else can replicate. I've whipped them all into one category because they serve the same purpose -- they're all different takes on sharing your best practices and actionable advice. Typically gated by an email capture form, these content types are ideal for lead generation and are a key element in any balanced marketing strategy. Close.io have clearly recognised the value of creating outstanding resources and are successfully harnessing these content magnets to source new leads. Takeaway: Need to inject new life into your lead generation game? Consider sharing some of your most effective practices, hacks or tips to become the industry's go-to source for top quality content. Do these Google search queries look at all familiar to you: "eCommerce statistics 2017", "email click-through rate benchmarks by industry" or "blogging statistics 2018"? In all seriousness, the internet's obsession with numbers is astounding. I, myself, can spend hours looking for interesting statistics and research insights, and I know for a fact that most of my colleagues do the same. Harnessing this content format could translate into a constant stream of traffic to your website and help you raise brand awareness. Hubspot, for example, regularly update their statistics page with fresh, interesting findings. Takeaway: With a few hours spent researching every week or month, you could easily attract new leads, build relationships and eventually drive profitable customer action. What's that, eh? Unlike infographics that focus on storytelling, instructographics are designed to inspire action and guide the reader through necessary steps to achieve a certain goal. Once you shift your focus from what to how, you assume the role of a teacher and a leader. Instructographics are great for when you want the reader to follow your exact instructions but still want to communicate in an original and engaging way. Oh, and if you haven't yet worked out how to salute the sun, here's a great instructographic to follow. Takeaway. This content type can elevate your how-to's and step-by-step blog posts to a whole new level. Slide decks is an excellent content repurposing format. The slides that you initially create for a webinar, event or an online course can later be easily embedded on your blog or shared on SlideShare. It's just another way to squeeze more value out of the work you've already done and many brands are having a go at it. Here's another example from content marketing champions at HubSpot -- 409,911 views of this slide deck speak volumes about the potential of content repurposing and distribution tactics. Creating fantastic content is only half the job done, the next step is to help people find it. Takeaway: Ensure you have your distribution strategy worked out well before you start crafting your content. When a new piece is published, it's not the time to think about how to promote it! Slide decks will be particularly useful for content formats that can be broken down into smaller bites -- think of it like a bread crumb path leading the user back to your website/main content piece. Pairing unique research insights with custom data visualisations is a winning recipe for success. Data storytelling engages both the rational and the emotional part of the brain, creating a long-lasting impact on the reader. Graphs, charts and diagrams are great, and they help to elevate research findings to another level, but marrying data with narrative and visuals leads to a truly delightful content experience. Take, for example, this piece on daily creative routines. Both engaging and fresh, this data visualisation campaign hits top marks and gives us plenty to be inspired about. Takeaway: Data is only as powerful as the story behind it. Always look for ways how to present it in new and unexpected ways to benefit from the element of surprise and the glamour of novelty. Human beings are social animals -- comparing ourselves to others is what we're really good that, so if you have a chance to draw on that, don't miss it! The simple explanation why gaming mechanisms found their way into the world of marketing is that they drive motivation and engagement. Content gamification appeals to the competitive nature of humans, injects fun and excitement into brand communications and can help marketers reach very specific goals. One of the most interesting gamification examples comes from SEMrush, a digital toolkit for online marketers. The company has successfully turned their technical user manual into a gamified experience that both entertained and educated their users. Takeaway: SEMrush developed a holiday-themed game, offered a symbolic reward and sent out an email to their user base -- that's all they had to do to create their most successful social campaign to date. It was a cool and creative take on content gamification - no spectacular visual effects or elaborate narratives needed. Applying gamification techniques to your content could drive unseen engagement, brand advocacy and even conversion results, but you must be strategic about it: set goals, define your audience, align your game with a bigger event, make it look and feel amazing, and add a reward to spice it up. Game on! Often appearing as PDF's, whitepapers are in-depth reports that explore a particular issue and present the authoring brand's philosophy and solution to that problem. They work particularly well when combined with case studies; marketers often use real-life examples in their whitepapers to persuade prospective customers that their methodology, approach, and ideas provide the best solutions. It's usually not something people read for pleasure, but because of its educational nature, readers gladly "pay" with their email address to download a whitepaper from thought leaders and industry experts (amazing if you're looking for high-quality leads). Takeaway: This is a serious piece of content. Usually much denser than an eBook, a whitepaper is not designed to be skimmable. If you have some solid research (backed by plenty of references), high-level expertise and an interesting point to make, it's worth investing your time into this content format. Many great things could be said about live streaming -- it makes brands more human, encourages conversation, enables improvisation and transforms boring brand communication into brand storytelling. It's awesome. The catch here is that live streaming requires a lot of before and after preparation. There usually is no script and the story can unfold in many unpredictable ways. The most popular video streaming formats include Q&A's, customer support sessions, product reviews and unboxing, interviews, how-to tutorials, events and behind-the-scenes peeks. There's so much a brand can do to give their fans and followers a taste of who they are, what they care about, and why that matters. An e-commerce store Kohl's provides an excellent example -- their live workout session streamed on Facebook has generated 36k views and was well received by their social following. Takeaway: Choose a live streaming format that brings out the best aspects of your brand and aligns with your mission. You can invite your customers and followers to be part of something that matters to you -- what is it going to be? Besides the obvious value they add to a brand's visual fingerprint, custom illustrations reinforce the ideas expressed in a piece of writing and can sometimes elevate them even further. The human brain favours visual information. If the illustrations are crafted to explain and enhance the ideas rather than merely decorate a piece of content, they become invaluable in creating a unique content identity. Brands that take content marketing seriously, should rethink their visual strategy and stop relying on free stock images. Takeaway: Custom illustrations can help you connect and explain complex ideas while reinforcing your brand's visual identity and style. Investing in bespoke illustrations will take your content from great to exceptional. It won't be a great fit for all businesses, but aerial photography can dramatically boost a brand's appeal. If you're in an industry that already relies on the visual information to attract and entertain prospects, such as travel, events or personal training, getting a drone up in the air to capture striking, one-of-a-kind images could be the one element that your content was missing. Adding drone footage to the mix allows brands to showcase the breadth and beauty of products, locations and people from completely new angles. Takeaway: Evaluate what aerial photography can do for your brand. Just because everyone's flying drones and snapping pictures, doesn't mean those pictures translate into more business. Comparison content is much liked and sought-after by prospects in the decision stage. It is often the go-to tactic for product reviews but could be applied in many different ways to contrast topics and help readers make up their mind. Indirectly, you're also sending your prospects a message of confidence -- "our offer beats everything else on the market". The "versus" content should be designed to showcase how and why your product or service compares to the other solutions and highlight your USP's. Takeaway: Product reviews and comparisons have become an integral part of how people shop online. Missing out on that critical information at the latest stage in their buying journey could be the one thing that's standing between your brand and more sales. Find the most suitable format, style and angle that will allow you to remain objective while still showcasing your top features and add this idea to your content mix. 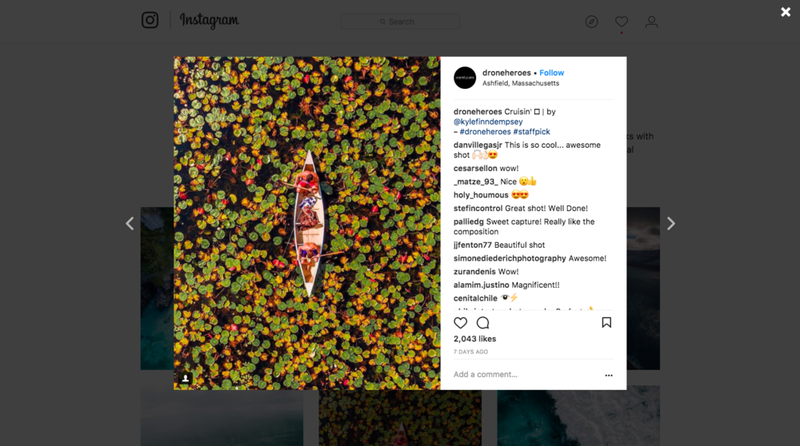 The biggest advantage of user-generated content campaigns is that they create engagement with existing customers, which, in turn, drives engagement with potential customers. Getting your users to participate in contests or creative campaigns boosts their loyalty, increases sales and helps you raise brand awareness. Everyone knows that maintaining an existing customer is much cheaper than acquiring a new one, so you should never focus all your marketing efforts exclusively on generating new leads -- user engagement is a critical aspect of a healthy bottom line. Muji, a Japanese-based company that sells high-quality stationery products (amongst many other items), delivers an outstanding example of a creative content campaign that relies on user-generated content. 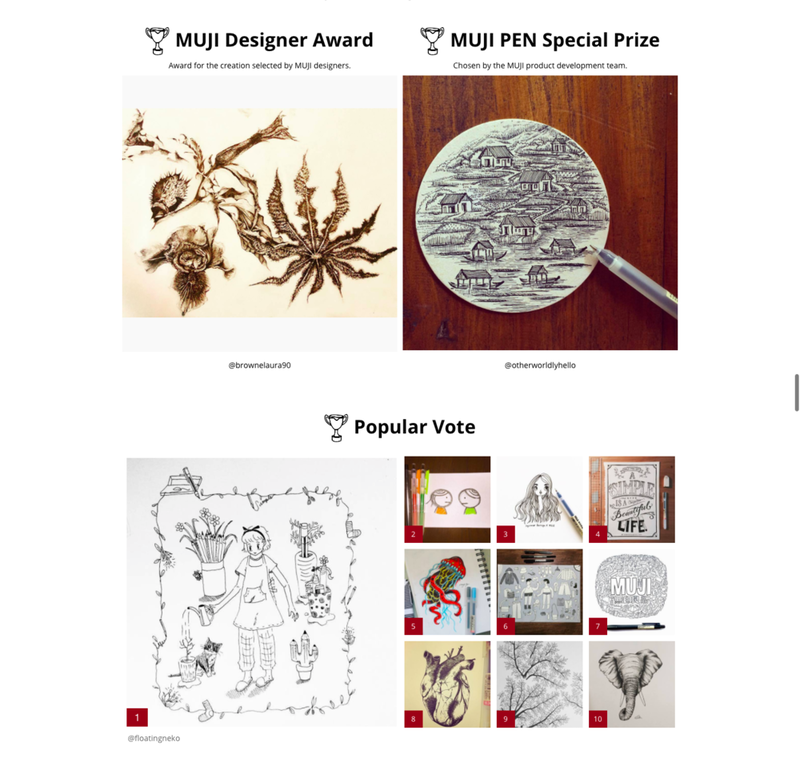 The brand has hosted an art challenge asking existing customers to draw something with their iconic Muji pens and upload the images to Instagram with a custom hashtag (#MUJIPENART). The contest has generated dozens of high-quality entries, providing the brand with heaps of unique content. Takeaway: You'll often find that people don't just buy your products, they buy the lifestyle that these products represent. Tapping into those aspirations and drawing your fans in with unique contests and challenges will help your brand form a stronger community and identity. Besides, you can use all that original user-generated content to continue building your brand and raising awareness of your products. Netflix-loving, pizza-obsessed, uber-pooling marketers rejoice -- GIF's are no longer considered just silly, looping clips taking over the social media space. Symbolising a significant shift in the internet culture, GIF's are now a recognised form of content, giving marketers a whole new set of tools to work with. From Slack to Facebook to Instagram, GIF's are becoming an increasingly popular way to express emotions and share stories. That's why brands should seize the opportunity to use them as a means of getting in front of millions of digital eyeballs. A number of leading brands is already exploring the GIF hype and what business value it can create: here are a few branded GIF's for your inspiration. Takeaway: With a bit of research and data analysis, you can quickly figure out how your prospects are using GIF's to communicate online. Once that's clear, get your creative juices flowing and start crafting branded clips to reinforce your brand, tune into trending conversations, and reach millions of potential customers every day. Webinars are a particularly effective way to achieve two goals -- grow your email list and add a bit more personality to your brand. As a content marketing format, it often receives bad rap for being too demanding, since it requires prospects to dial in and watch it live -- and that's a big ask in a fast-paced world. However, brands that deliver high-quality online tutorials enjoy great engagement levels, are able to gauge prospects' interest in specific topics and nudge them forward in their buying journey. Here's how Copyhackers are taking advantage of webinars. Takeaway: To be effective, content marketing must be strategic and tailored. If you think your audience would appreciate a live or pre-recorded webinar on a particular topic, then give it a try. You will always be able to use it as a free value-add in your onboarding campaign or as an in-depth resource on your site. I have to confess that I've never created one, but a few minutes of quality browsing time on Pinterest has given me enough confidence in this format to include it in my favourites list. As a fresh take on an infographic, a gifographic offers the advantage of dynamic and fun content. Instead of scrolling to see lengthy explanations, viewers can get all the information in just a few seconds. And because they're still quite rare, gifographics can also boost your brand image and showcase your creative thinking. Takeaway: Gifographics are much easier and cheaper to create than videos. If you need a blended solution that both attracts viewers' attention and drives social sharing, consider gifographics. Another huge benefit of this format is that it builds organic backlinks (SEO gold right there!. It's become ubiquitous for businesses in all industries to develop mobile apps that act like extensions of their websites to reach customers on the go. Without a mobile presence, companies would struggle to retain customers' loyalty, let alone, increase engagement. However, when it comes to content strategy, few manage to come up with fresh, tailored campaigns that cater to the mobile audience -- merely reposting the same content from the blog is not enough. Like a microsite, a mobile app can serve any purpose. For example, Calm, an app for mindfulness and meditation, has recently released a collection of bedtime stories read by well-known voices that help people fall into a deep sleep every evening. It's a unique approach to content marketing that really deserves a big thumbs-up. Takeaway: Developing a mobile app can eat into your marketing budget, so consider it only if the estimated ROI is rock-solid and your mobile audience is growing. Remember, it doesn't have to mirror your website as long as it's serving a specific, strategic goal (or do what Calm did and just get Stephen Fry to read anything). There are many types of creative partnerships, and while content partnerships are less known than, say, sponsorships or affiliation, they're nonetheless less effective. When two or more brands find a way to collaborate on the same topic, some truly interesting content can emerge as a result. Two main ways that brands can partake in content partnerships are co-creation and link sharing. Co-creating means both brands contribute to shaping, crafting and promoting the content to gain mutual recognition, while link sharing signifies that the primary brand creates everything and works in partnership with the secondary to push it out to the world. The Budweiser & Uber campaign released around Christmas 2016 is a great example of a creative partnership that's given both brands a boost in popularity and recognition. Takeaway: The key to successful creative content partnerships is finding a brand that shares similar values and philosophy and targets the same demographic as yours. Aligning your objectives and leveraging existing influence will double your reach and chances of suceeding. Long-form branded video content is something that marketers are just beginning to embrace. Take, for example, this branded content campaign from Coors Light. With a Coors Light bottle making a humble appearance only once during the two-and-a-half minute video, it's obvious the brand is shifting its focus from its own products and aiming to create a broader lifestyle appeal through personal stories. Mini-documentaries like this one allows companies to zoom in on diverse voices, producing content that's relatable and appealing on the emotional, human level. Takeaway: Branded video content is about the higher purpose, broader appeal and positive associations. Forget your USP's; to hit the mark you must talk about things that matter to your audience. FAQs (or frequently asked questions) is a huge asset. Not only do they give companies a unique insight into what customers care about, they also allow them to reinforce their mission, vision and branding. With a little bit of creative flair, FAQs can easily be turned into an evergreen content campaign. If a customer is browsing FAQs, it means they're looking for help, guidance, that bit of extra information that would save them from contacting your customer support. It's an opportunity for you to delight and over-deliver to build trust and show your commitment. Known for their outstanding customer service, Virgin Holidays has done it again (see a screenshot below). Takeaway: If you've fallen into the trap of boring, technical or corporate FAQs, it's never too late to rewrite them to spark meaningful conversations (and not angry support tickets). Have you ever taken to Google in a frantic effort to figure out what a never-before-heard buzzword means? Chances are, you have (as have thousands of other overwhelmed marketers). The thing about glossaries is that besides their immense boost to SEO, they're also designed to deliver specific value to a reader in need of an accurate, straightforward answer. There's something extremely satisfying about quickly discovering a well-rounded answer (talk about the power of instant gratification), which makes glossaries a go-to tactic in industries that suffer from jargon overload. Here's an example of a living glossary for influencer marketing from Traackr. Takeaway: As a cheap and simple campaign to create and implement, living glossaries don't receive enough praise for the value and effect they deliver. Give it a go! The parallax scrolling web design technique is not a content format in itself, but it gives marketers a fresh approach to storytelling. You can easily combine data, video, images and audio to create an interactive experience and pull your audience into a different world. Serving as a microsite for your campaign, it can either be the main piece or a supporting element in the story. And because of the flexibility that's ingrained in this technique, the psychological pull to scroll down and see what happens next is almost addictive. A beautiful example of the immense potential of parallax scrolling web design is brought to life by a wedding website created by a design power couple Russ Maschmeyer and Jessica Hische. Takeaway: For a parallax scrolling campaign to be successful, you will need two things: a bold idea and a creative designer -- everything else will fall into place! Since the wider adoption of VR, we've seen some shockingly good content campaign examples. TopShop's Virtual Catwalk Experience is one of them. The brand has given a few lucky competition winners a unique front-row view of their exclusive fashion runway show during London Fashion Week, using a 360 panoramic video stream. Blending exciting new technology with exclusive content and the scarcity effect (it was only available to a handful of competition winners), the brand has executed the campaign to the highest standards. Takeaway: Remember that technology is just a means to tell a story. If you want to add VR to your content mix, ensure you're doing it for the right reasons (because it's the new big thing doesn't count). VR content is the closest consumers can get to experiencing your products, services or places without physically being there -- take advantage of that! This is not your usual go-to content marketing tactic and can hardly be classified as a stand-alone campaign idea, but it's a nice-to-have that compliments your overall content mix. Whether you choose to create your own branded playlists or leverage playlists created by other Spotify users, it's a neat way to connect with followers, reinforce your brand and create certain associations. You will say that I'm biased, but I'm in love with Lithuania's new playlist "Lithuania 100", celebrating 100 years since the country declared its independence. The playlist contains one hundred songs produced during 100 years of freedom. It's a fresh and creative way to get the message out and add another flavour to the overall nation branding strategy. Well done, team Lithuania! Takeaway: Don't worry about putting yourself out there with non-standard ideas like Spotify Playlists. If your brand has a strong why, you likely have a very clear idea of who your target audience is and what they like. Use that to your advantage -- follow the music and add some good vibes to your marketing. Or, vice versa, use playlists to attract your ideal customers. Print is back. Remember all that chatter about books being dead when Kindle came out? Well, it's far from being true. The screen fatigue is becoming a huge problem in the modern world, with scores of people opting for paper again. Whether it's a book, a magazine or a brochure, brands have realised that print is a valuable addition to their content marketing plan. In fact, according to CMI research, two-thirds of B2C and B2B marketers use print to distribute content and consider it one of the top 3 most important channels. For instance, Airbnb has launched an Airbnbmag to spread the love of travel and reach new audiences, and it's even charging for it! Takeaway: Writing off print would be a huge mistake. Look for ways how to repurpose your existing content (for example, you could gather your best blog posts from the previous year and turn them into a glossy magazine with bespoke illustrations and photos) or add another dimension to your ongoing content campaigns. Print is alive and thriving! If video storytelling wasn't successful, we wouldn't have cinemas. Some content experts have gone so far as to proclaim video storytelling the future of content marketing. Is it really so far-fetched a possibility? I'm not so sure. Combining the two most powerful content marketing elements -- storytelling and the visual medium -- can truly be the bomb your content strategy needs. Not every video is a story, but every story can become a video. For your inspiration, here's a creative video storytelling campaign from Coca-Cola Latin America who have produced three short films targeting teenagers. Takeaway: People love stories, especially the ones that leverage suspense, anticipation, intrigue. Take a different approach to your strategy and break up your content into bite-sized video stories. It might just blow it out of the water. This is a living piece; I will continue to add new, interesting and fresh content ideas as I come across them (or think of them) in the future. Have I missed something big? Don't sit on it, give me a shout in the comments! And thanks for reading (or skimming through), I know it took a lot of stamina. Have a question? Need a hand with your content? Drop me a line!